There’s something about Italian vocal music that is well-suited to brass instruments; whether it is vibrant bravura writing or a soaring cantilena. 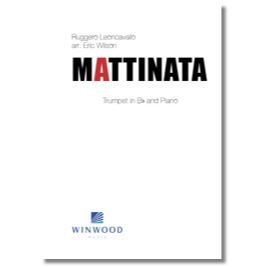 Ruggero Leoncavallo’s Mattinata (Morning or Morning Serenade, to be more poetic) certainly soars and captures the sparkle of a bright new day. The lyrics (by the composer himself) are a greeting from a lover to his partner urging her to awaken and come to him – sunlight is missing without her! The music is suitably bright and cheery, becoming slightly more grandiose toward the end. 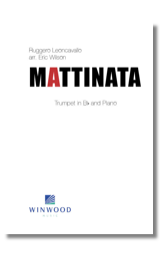 In arranging it for trumpet I wanted to provide players with something in D major that wasn’t a Baroque trumpet tune and featured lyrical yet agile lines. The song has the distinction of being the first written especially for recording. That recording was made by the Gramophone and Typewriter Company (known today as HMV) in Milan Italy in 1903 and features the great Enrico Caruso accompanied by the composer at the piano. You can listen to it at https://archive.org/details/mattinata1903 although there are countless modern recordings to listen to as well. Some tempo markings are given in parenthesis and I’d urge players explore their own interpretation.